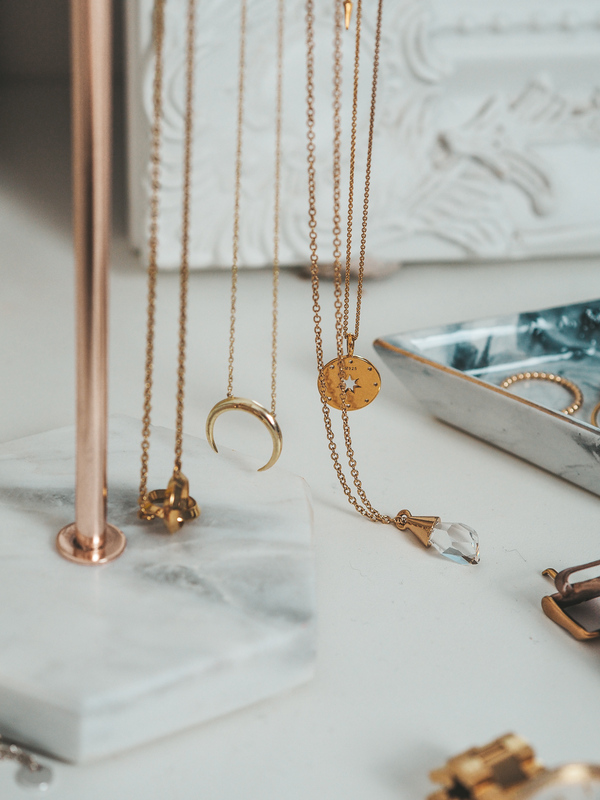 If you saw this post back in January, you’ll know that I’ve recently built a real interest in building my jewellery collections, especially with higher quality pieces. I’m loving being able to accessorise my outfits more, whether that be with some statement earrings, or layering some necklaces. And today, I thought I’d share with you what my jewellery collection (a work in progress) currently looks like. Necklaces are what I’ve invested into most recently. My favourites obviously being the two I picked up from Missoma for Christmas. I know when it comes to Summer and I’m wearing less high-necked tops I’ll be layering the Leaf Choker and the Star Struck Amulet necklace daily. Other necklaces I have though, are the classic horse-shoe piece I was gifted from John Greed, and the Double Gold Calvin Klein necklace, also a previously gifted item. The more sentimental pieces I have include a Saint Christopher necklace (my whole family have one of these) which I always wear if I have any important exams or tests, and the silver Pandora hearts necklace – one of the first pieces of jewellery Jamie ever bought me. 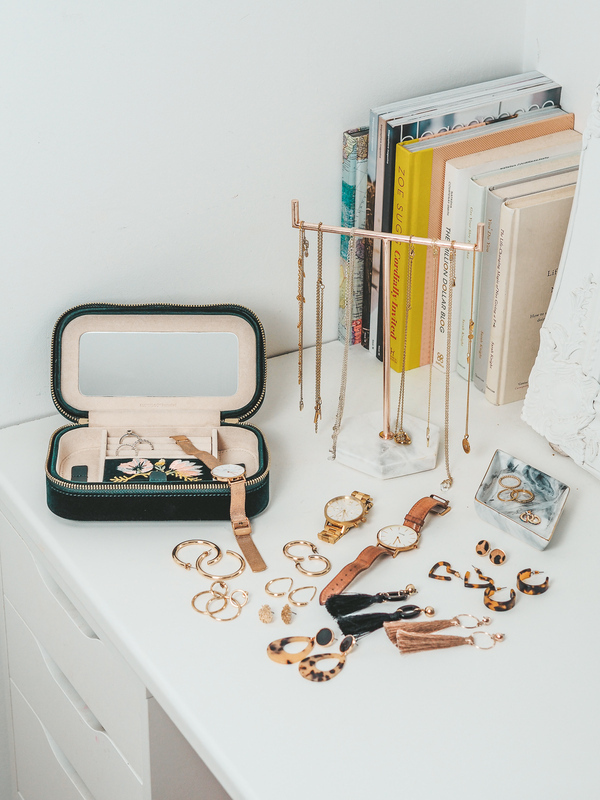 I’ve got a few watches, my favourites being a classic brown leathered strap – La Boheme Rose Gold from Cluse (every girl needs one of these in their jewellery collection), and the Rose Gold Petite Melrose watch from Daniel Wellington (gifted). For rings, another very much work in progress, I have a few gold and a few silver. I have a couple of stacker rings, one from Pandora and another from the Bath Christmas markets, and a love-heart gem ring which again, Jamie got me a few years ago. When it comes to earrings, my go-to’s are the thick gold hoops from H&M (similar here), or the two interlocking rings from ASOS. I’ve loved the tortoise-shell trend this season though, and just LOVE the love-heart shaped earrings I picked up from ASOS just a few weeks ago. 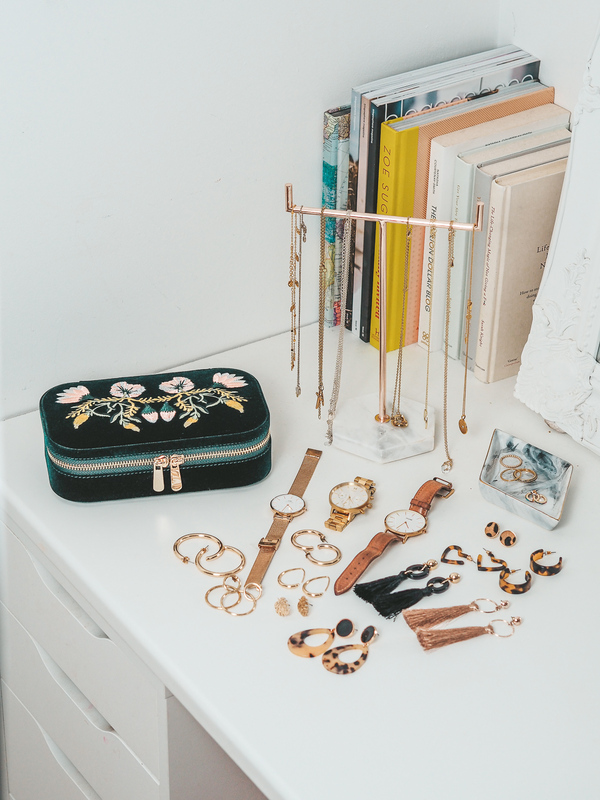 Statement earrings are what my current collection is lacking – with just a few sets of tassel. My aim is to one day have every colour under the rainbow. Watch this space! 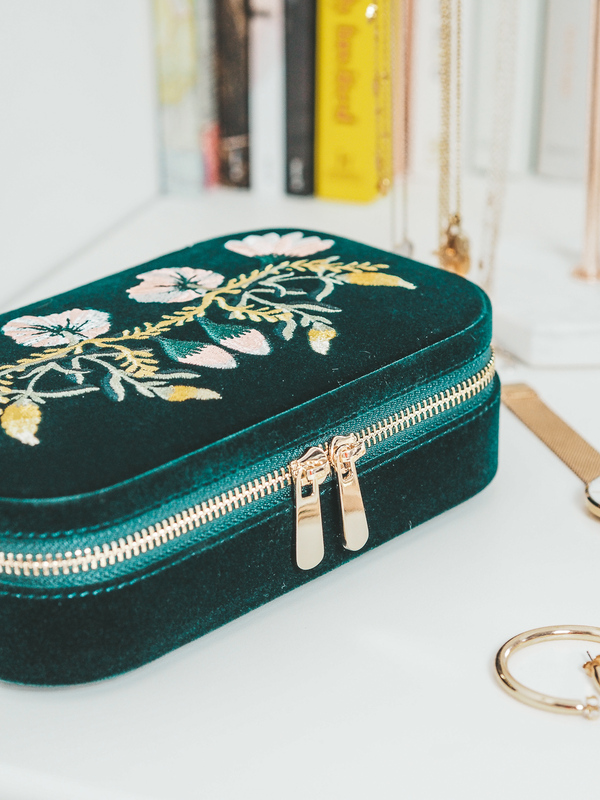 The Zoe Travel case is made of velvet, adding to it’s super luxurious look and feel, and has plenty of storage for jewellery. It has a mirror, 3 ring rolls, a medium compartment with a cover, as well as 2 smaller compartments. Tangled necklaces no more! 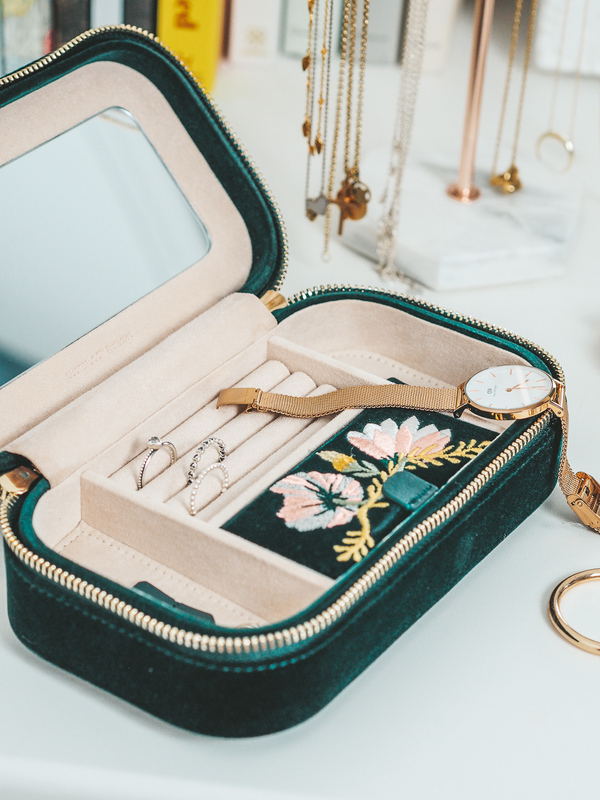 As well as all this super handy compartmentalisation, the fabric lining the inside of the jewellery case absorbs the hostile gases known to cause tarnishing. Under typical storage conditions, it can prevent tarnishing for up to 35 years. How impressive is that?! 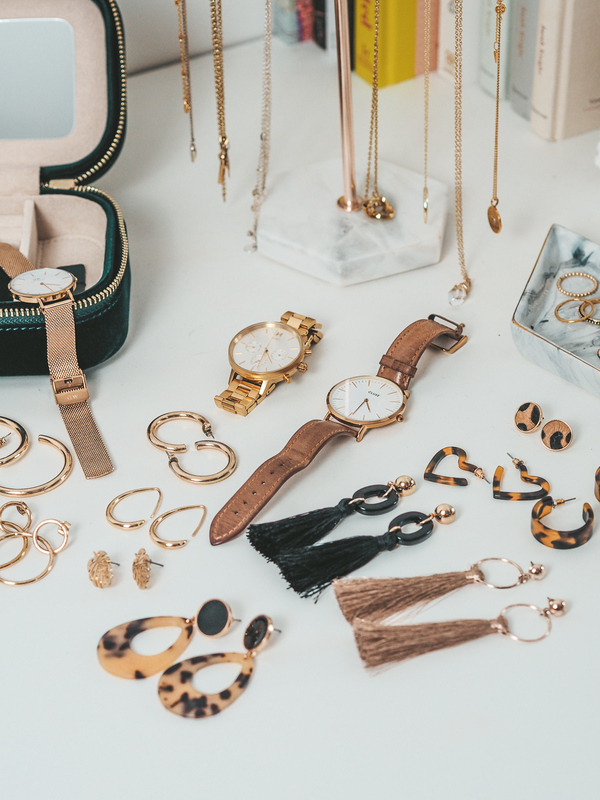 I hope you enjoyed having a peak inside my current jewellery collection. 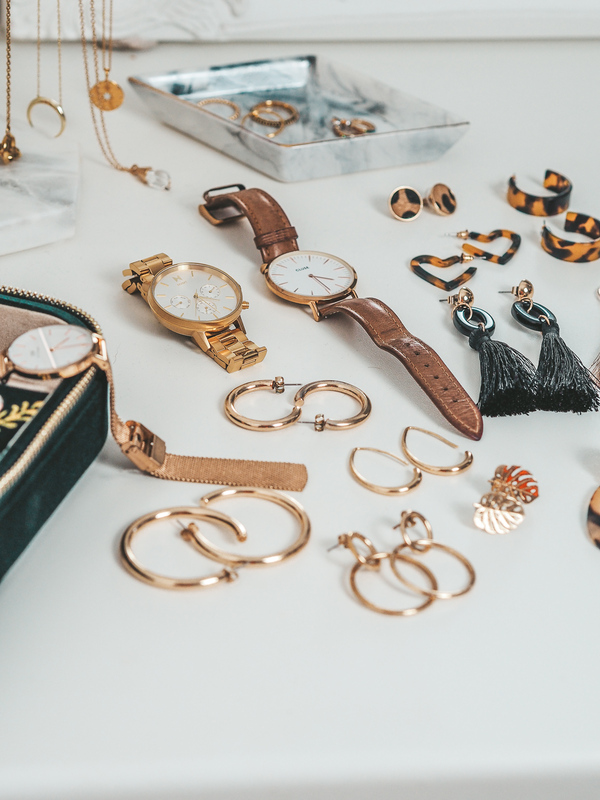 As time goes by, I realise the importance how much a bit of good accessorising can compliment an outfit, so building this collection is one of my top priorities for this year! 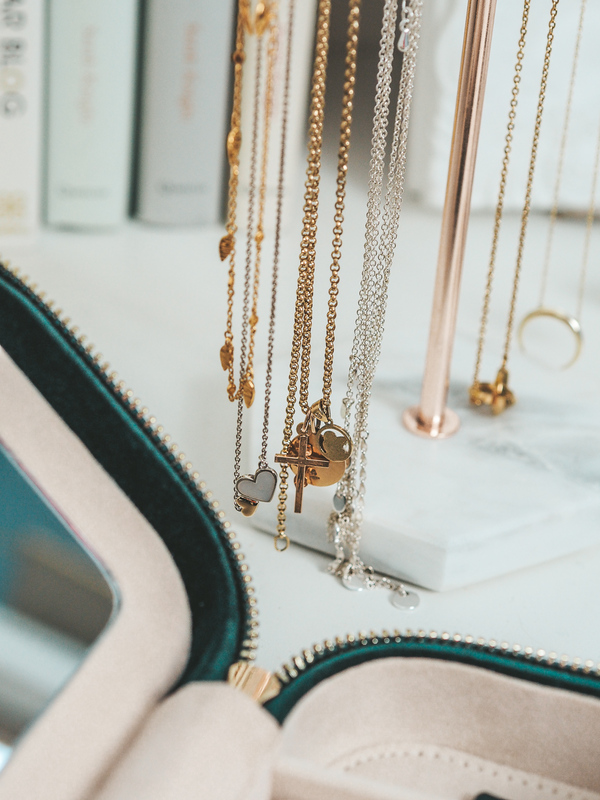 What are some of your favourite jewellery pieces to accessorise with?